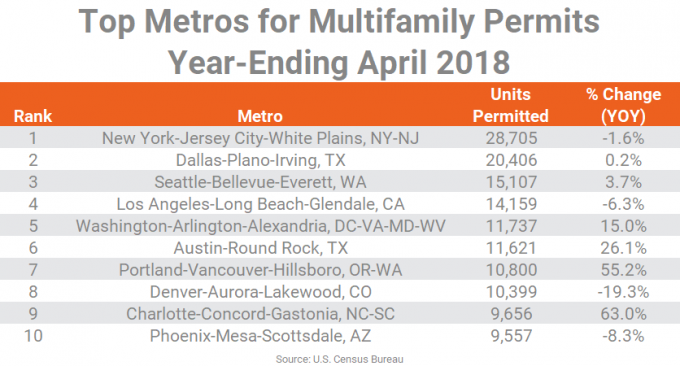 After surpassing the 400,000-unit mark two months ago, annual multifamily permitting activity has continued to rise, with the April 2018 total reaching a 23-month high. 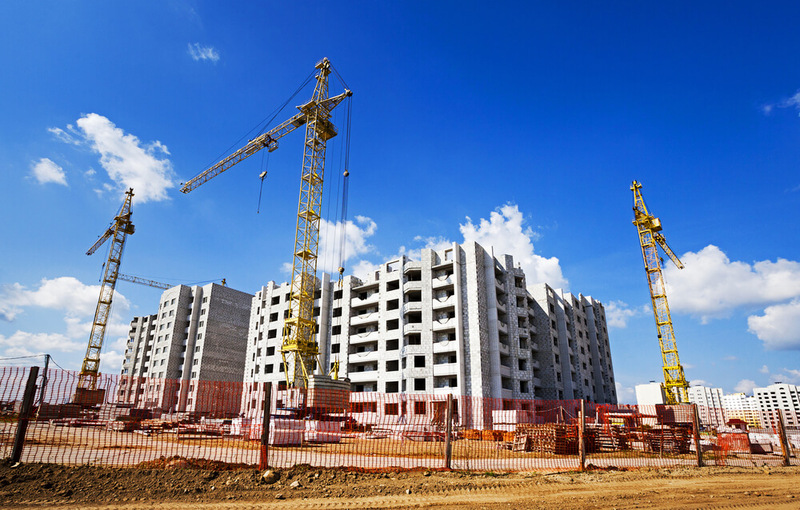 Local governments across the country approved 414,380 multifamily units in the year-ending April 2018, according to U.S. Census data. That permitting activity, inclusive of the 37,437 units authorized during the month of April, represents a 1.6% increase from March 2018’s annual volume and a 3.8% hike from April 2017’s annual total. The current annual level is the highest since May 2016. It is the third straight month that annual permit volumes topped the 400,000-unit mark. Permitting at that level has not occurred in consecutive months since November 2016. Annual approvals ran slightly below 400,000 units in most months from December 2016 to January 2018. Those numbers represented a lull following a period of more significant permit volumes from June 2015 through November 2016, when annual totals averaged nearly 430,000 units. The metro-level leaderboard for annual permitting activity in April 2018 looks very much like the March leaderboard, with all but one of the 10 metros returning. The top four locales – New York, Dallas, Seattle and Los Angeles – still held onto the top four slots. The only newcomer to the list was Charlotte, which climbed into the #9 position, knocking Chicago out of the top 10 for the first time since July 2017. Six of the top 10 markets experienced increases in annual multifamily permitting volumes from the previous year. Charlotte and Portland recorded particularly significant progress, with approvals topping the previous year’s tally by more than 50%. In fact, in each of these markets, annual permitting volumes are at their highest point seen in at least two decades. Among the metros where permitting decreased, Denver saw the largest decline, with 19.3% fewer apartments approved in the year-ending April 2018 than in the previous year. However, this metro is still registering permits ahead of long-term historical averages. The same is true for Los Angeles and Phoenix. New York, however, recorded permit levels a little below the market’s historical norm. The 28,705 permits approved in the year-ending April 2018 by this perennial top performer were down 1.6% from the previous year’s total and roughly half of the recent peak seen two years ago. 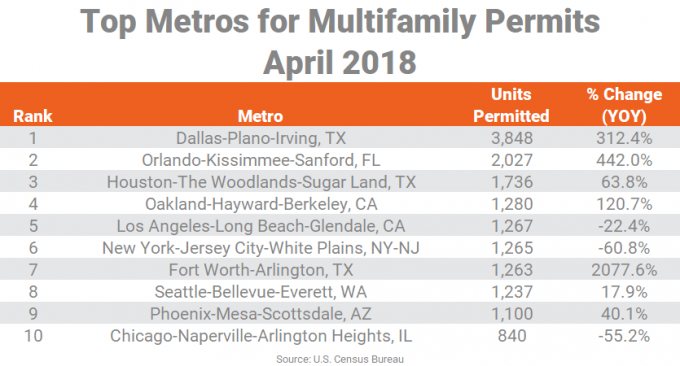 With most of the top 10 markets reporting at least some year-over-year increase in multifamily permits, the annual total of approvals in the top 10 metros – 142,147 units – was 5.4% greater than the 134,835 units issued in the previous 12 months. The total number of permits issued in the top 10 metros was almost equal to the total number of permits issued for the #11 through #37 ranked metros. For the month of April, the nation approved permits for 37,437 multifamily units, up 21.6% from the April 2017 volume. The metro-level leaderboard saw some major shifts since March, with four of the top-permitting metros replaced in April. Dallas climbed to the top of the list in April, with 3,848 approvals. That’s the market’s highest single-month tally in 30 years. Meanwhile, Orlando shot up from the #9 position to land at a strong but distant second place in April. Houston was new to the list this month, with 1,736 permits. Recording approvals just shy of 1,300 units in April were Oakland, Los Angeles, New York, Fort Worth and Seattle. Oakland climbed from the #6 position in March to the #4 spot in April. Los Angeles and New York tumbled from their rankings in March to stand at #5 and #6 in April. These metros registered permit volumes well below the April 2017 tallies. Fort Worth was new to the rankings in April. The 1,263 permits issued this month is more than 20 times the volume approved in April 2017. This was the leaderboard’s greatest year-over-year change. 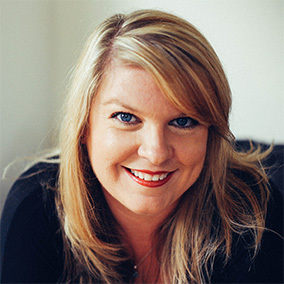 Seattle fell from the #3 position in March to #8 in April. But the permits issued in this metro were well ahead of the volume the market recorded in April 2017. Phoenix and Chicago were also newcomers to the list in April, with approvals of about 900 units to 1,000 units. For Phoenix, this placing represents a return to the leaderboard after only one month away, while Chicago hasn’t been on the top 10 list since December 2017. The introduction of Houston, Fort Worth, Phoenix and Chicago to the leaderboard pushed out Denver, Atlanta, Austin and Portland from the standings.